When Curiosity came burning through Mars' atmosphere two-and-a-half years ago, it marked the planet with its landing, and the impact of shedding its sky crane, heat shield, backshell, and parachute. But the planet is recovering, obscuring the scars with unending wind and dust. Hey everyone, look! It&apos;s NASA&apos;s space litter! The red planet is also the dusty planet. Despite how relentlessly the Opportunity rover is creeping into its second Martian marathon, dust on its solar panels can choke its power down until wind cleans it back off. Curiosity relies on decaying plutonium dioxide for power instead of sunlight, but even so the occasional selfie makes it clear the rover could seriously use a bath. That same dust and wind is responsible for blowing away the marks of Curiosity's dramatic landing, slowly obscuring the artificial impacts of the rover and its landing hardware. When Curiosity landed on Mars, it made quite an impact between its actual landing and all the hardware it scattered across the landscape. 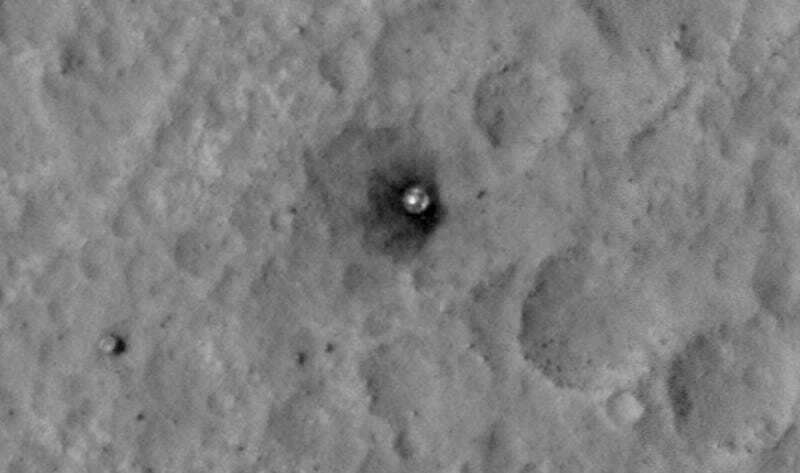 The dark marks were easily identified by HiRISE, a camera on the Mars Reconnaissance Orbiter with a processing computer protected by the Star Wars Imperial Guard. 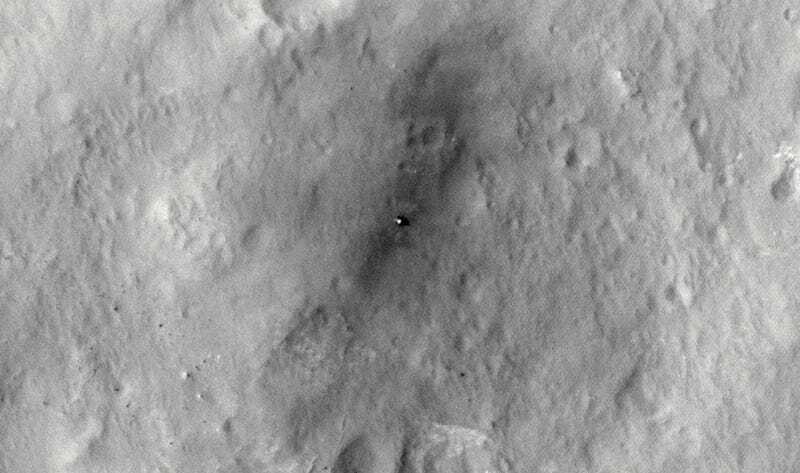 The landing zone has been imaged regularly in the intervening years. 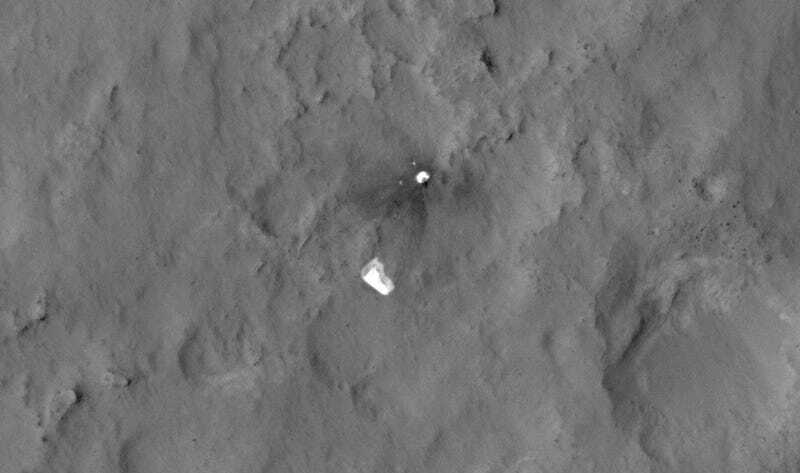 The images start six days after the landing, on August 12, 2012, with another on August 17. From 2013, the images were collected on January 13 and nearly a year later on December 11. 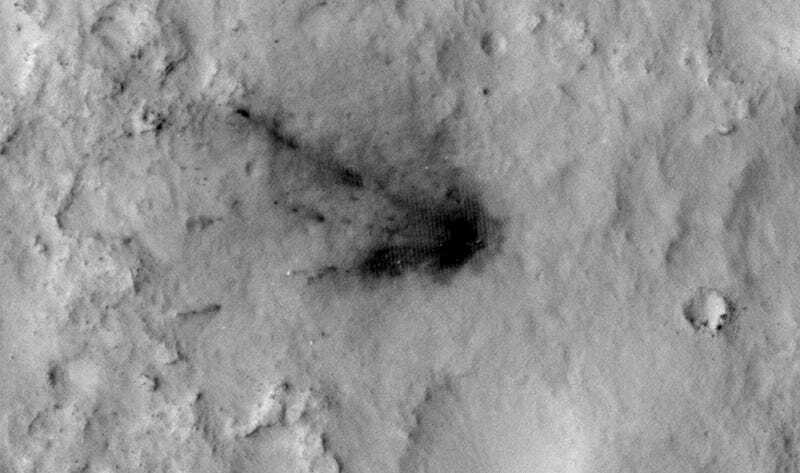 The 2014 images on April 11 and June 27 missed the location of the heat shield's impact, but it was included in the latest image from February 28, 2015. None of the images have been processed for consistency, so reveal differences in lighting and camera angles, so shadows create the illusion of a shifting landscape. While overall the dark blast zones are fading, the most recent image from February of this year reveals that not only have the areas not faded as much as we expected in the past six months, but they might have even gotten darker. This is puzzling, and yet another thing we can add to the list of things we still don't understand about Martian surface processes despite all the amazing discoveries and observations we've made.